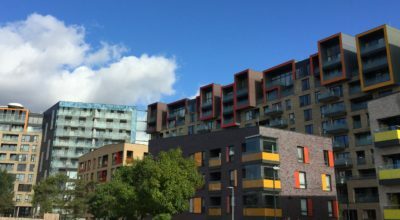 Trafalgar Place is a flagship housing development which forms part of the regeneration of Elephant and Castle. 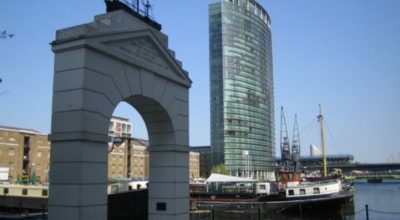 Conceived to improve inner city-living and help address London’s chronic housing shortage, 25 per cent of the project provides affordable housing and a key aspect of the scheme was to improve public realm spaces. 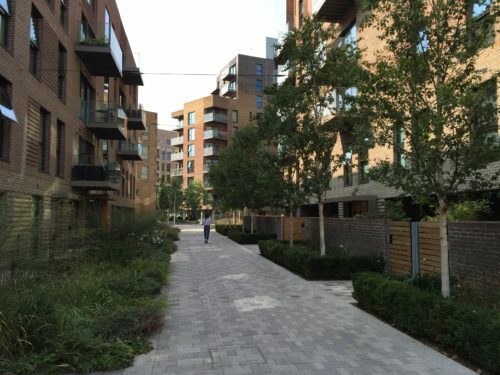 On the site of the demolished Heygate Estate, Trafalgar Place has provided 235 new homes. The seven buildings that make up the scheme are a mixture of mini towers, apartment blocks and town houses that range between four and ten storeys and each home has been provided with a garden, roof terrace or balcony as external amenity space. 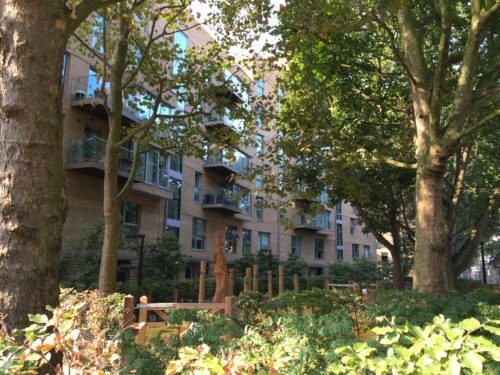 Described as ‘leading the way in innovative design’ by London’s former Mayor Boris Johnson*, the gardens are just one of the sustainability features that have been built into Trafalgar Place. For example, two of the buildings have a cross-laminated timber structure, which marked a new endeavour for the developer in the UK. 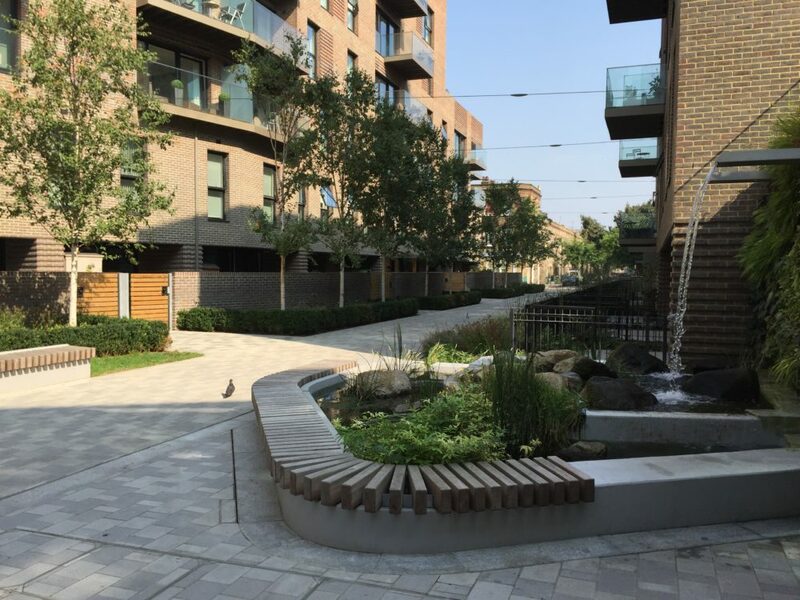 Among the accolades for the development are the Housing Design Award at the Bricks Awards and both Best New Place to Live and the Mayor’s Award for Planning Excellence at the London Planning Awards. Trafalgar Place was also shortlisted to receive the Stirling Prize in 2016.
noise transfer – both airborne and impact sound – between apartments, and between apartments and retail spaces, to achieve 5 dB and 10 dB better than the Building Regulations, respectively. acoustic absorption within common residential areas. 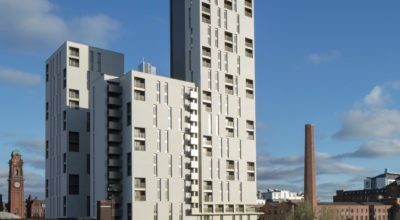 Acoustically, the decision to use cross laminated timber for two of the buildings was significant, as it was a relatively new product to the UK, particularly for residential construction. There was a client desire to expose the material where possible to reveal its warm and sustainable look, which could potentially have been made to work acoustically, but fire concerns meant plasterboard linings were required on both sides of party walls. These needed to be independent of the timber to avoid reducing the performance of the wall at low-frequencies. There were also concerns with the impact performance of cross-laminated timber, again primarily at low-frequencies, which was resolved by using a floating concrete screed for the floor finishes that also included the under floor heating. 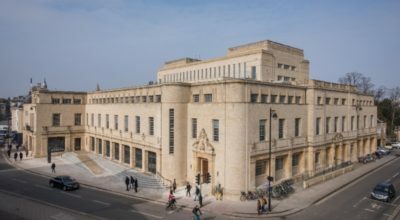 Once the first sections of the building were built, we put this recommendation to the test by configuring one apartment as recommended with the concrete screed and another with a resilient cradle and batten timber system, and invited the key client decision makers to experience the difference. There was a clear preference for the performance with the screed above, as it was unfortunately possible to hear people walking in the apartment above without it. We also performed impact sound insulation tests on the two cross-laminated timber floor constructions. Both resulted in similar overall performances, that bettered the Building Regulations by 10 dB, but the shape of the insulation curve was vastly different with the cradle and batten timber system having markedly poor performance at low-frequencies, meaning you could hear people merely walking in the rooms above. The cross laminated timber with the concrete screed did not have this problem. Performing these tests helped Lendlease to assess the benefits of each floor construction and establish which would best suit their needs. As the concrete screed mitigated the more commonly occurring noise source, it was decided to continue with our recommendation to use the concrete screed construction. In other areas, where more standard constructions were used, there were still concerns with the car parking areas under the buildings’ central podiums. These areas extended under and abutted a number of duplex residences. 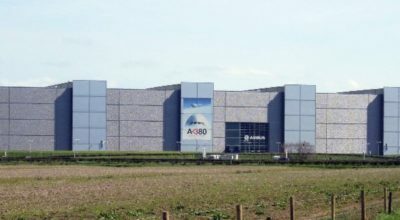 Special walls were developed that provided the extra sound insulation needed while also allowing the thermal and structural requirements to be achieved. Another aspect of the development that was important for the acoustic design was the provision of balconies, roof terraces and gardens to each apartment. While the intention was to provide a tranquil urban environment for the residents, these open areas would be more susceptible to the road traffic in the area. Therefore, a number of attenuation measures needed to be specified which included the provision of solid glass balustrades and floors that provided a small but useful amount screening for the balconies.